Past actions impact your present and future results. That’s why smart planning sets you up for success. In this first episode of a three-part series, James Schramko talks about how you can plan deliberately so as to achieve what you want in your business. 03:43 – What’s the one thing that’s been working? James Schramko here. Welcome back to SuperFastBusiness.com. Today, I’m covering the topic of planning because where you’re at right now in life is pretty much a result of what you’ve done in the past. Now some of that may have just been drifting along as things come your way. Other things might have been deliberately structured. You could argue that having a deliberate intent for an outcome could actually help you achieve that outcome, and that’s where planning comes into it. So I want to cover this in a few parts. We’re going to look at why planning is important. We’re going to have a look at three layers of planning, and then we’ll talk about how you might execute and actually get results. So why is planning so important? Well, let’s just have a look at this. I’m a surfer and when I go surfing, there’s lots of waves coming in. What my instructor pointed out to me was that there’s a lot of opportunity, and I shouldn’t just take off on the first wave that comes along. Even if I could catch it, there might be a better shaped wave just behind it. So what we do is we get to this idea that opportunity really can actually take you off track. You may not have to look much further than your inbox to recognize this. Do you find that you’re getting emails from all different marketers, and the next thing you know you’re clicking on a link? And then shortly after that you’ve decided you’re going to setup an Amazon product or you’re going to be in some new business model that you hadn’t considered before? The reason you hadn’t considered it before is it wasn’t in your plan. So what I want to put forward is this idea that we generally don’t have to act on opportunities immediately. Often, there’ll be another opportunity coming your way, and most definitely, we want to decide if that opportunity actually fits with what we want to achieve. So a big part of that is to decide on what you actually want to achieve in advance. So we really want to focus on what’s important and we want to not focus on everything else. There’s a lot of distractions that come our way. So step number one would really be: eliminate the noise coming through that is accessing your sphere of concentration, and attention, and willpower, so that you can reduce down the number of inputs to the things that are vital and recognize that even though other people have an agenda for you, and they feel that things are super important, if they don’t fit into your plan, and if they don’t get you the results you want to get, you shouldn’t be participating in it. So we’re going to talk about this idea of going through your data and making a decision and then executing it. Let’s focus on what’s really important. If only a small percentage of things are important, and we have got a limited and finite capacity to execute, then we should really only look to attend to those small percentage of things, that granular data that’s coming through that will identify which things are more important than others and lead us to optimizing what we can do in the future. So what I mean by all of those words is what’s worked really well for us before? How can we strip out everything that hasn’t been working and just focus on the stuff that has been working for us before? So if you’re always tired, if you’re always buried in your inbox, unsubscribe, delete, purge. I’ve done that on other episodes, on this topic of cleaning up your mess so that you can get focused. And then get clear on what you actually want. Get clear on what the result you want is and then you can instantly recognize if you’re focusing on the right things or the wrong things because now you have a test. You can filter and say, “Is this helping me get the result I want? Or is this taking me away from the result that I want?” So literally, you have to get out of your own way and stop being the roadblock to your success. Now if your business was going to crash to the ground and you could only execute one idea, what would it be? That’s probably where you should start. If there’s one thing that’s been working for you already, then start with that. Look to that for clues to inform you as to what the right activities would be and then forget about the rest of the stuff. Just release them. I can share with you an exercise that might help you get started. If you’re feeling a little overwhelmed, before you even think about the next parts of this training where I’m going to talk about the three layers of planning and executing your plan, you really need to get rid of what’s in your mind right now. You need to empty and delete some information. So go to a whiteboard, if you have a large one, or a big sheet of paper, and write down everything that’s on your mind. Just pour it all out. Just dump it out. Get it out. It might take you a while. It might take you half an hour, but just start writing and don’t stop until you can’t think of anything more that’s on your mind. 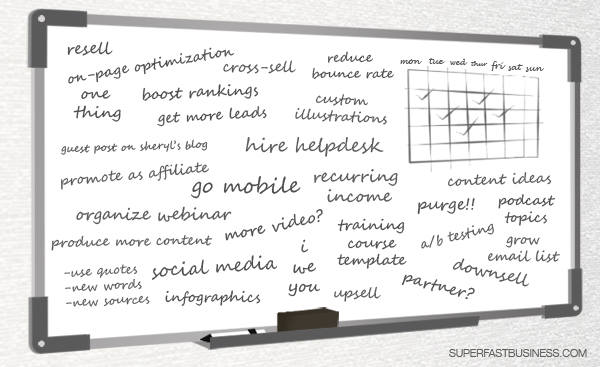 I know on the back of my whiteboard, I’ve got a double sided whiteboard, on the back, I’ve got my big challenges. They’re the things that are on my mind and I release them from my mind onto the back of the whiteboard so that I don’t have to consciously consume capacity everyday thinking about them. So I release them from my mind. And then on the front, I usually just have one or two things that I’m really focused on right now. But after you’ve done this big purge, then you can take a picture of your whiteboard or your piece of paper, and then you’ve capture now all the stuff that was in your mind. You can file that away in Evernote or Dropbox. And then you can rub it out, or just literally tear up the piece of paper, or put it in the shredder, or roll it up into a ball and bin it, now you’ve captured it on a piece of paper and then photographed it, because now you’ve released those ideas from your head. That is when you can start thinking about where you want to go. So how do you think about what result you want? Well I like the railway metaphor for this. So the railway metaphor will really help you if you’re constantly changing course and transport modalities in your business. Some people are literally addicted to change. I see some people go to event, after event, after event, and then 2 years later, they have achieved nothing except for go to event, after event, after event, or webinar, after webinar, after webinar, or course, after course, after course, and they’re constantly consuming, and buying, and attending, and burning up energy in that phase and they never implement or execute, and they’ve got such an overload now because they’ve basically burdened up their brain with so much information; they don’t even know where to start. The fact is that starting is literally going to force you into overwhelm because you’ve got all this knowledge but no implementation. So get implementing early. But before we do that, let’s just think about the railway metaphor. What we want to do is we want to imagine that we want to get someplace. So we’re standing at Grand Central Station right now and we want to imagine the result we want. Maybe it’s we’d like to have a successful coaching business, maybe it’s that we would like to be a successful affiliate, maybe we’re building a membership or subscription, if you’ve been listening to any of my recent episodes. Whatever that is, imagine it and walk around it, and really know it intimately. This is a visualization exercise. And make sure you’re happy with it. Are you happy to have the constraints that come along with that business model? Are you happy to be comfortable with the risks associated with that business model? You really have to own it in your mind first. And if you can imagine it and all the things that come with it, yes, you’ll have the fame and the glory and the income, but also you’ll have responsibility, you’ll have customers, you’ll have expenses. So there will be downsides, and inevitably, you will have some effort to achieve this because nothing ever comes from zero effort or zero input. You will have to expend some energy to get this result. Now that you’ve got this idea of what you want, you just walk back from that destination back to where you are now at Grand Central Station and imagine that you’re now going to build a railway track to that destination. You’re going to lay down the sleepers after clearing a path. You’re going to put down the rails. You’re going to get a train, you’re going to get on the train, and you’re going to start shovelling coal and pounding towards that destination. So now, when an opportunity comes your way, you can think about, how does that affect my journey here? No, I don’t want to go left or right, or take an airplane to some other country. I’m focused on this journey right now on my train. I know where I’m going, I’ve set my rails, and I’m shovelling coal. You might hear words like hustle and grind and all of that. Now here’s the good news: you can hire people to lay down the tracks. You can rent a train, you can get stuff to shovel the coal. If you want, you can be spending your time sleeping in the overnight carriage. You could be in the bar being served a lovely cocktail by your wait staff. You can control how this works, how your business works. But the most important point is you’re heading to that specific journey. And you know what the destination looks like and you’re already happy with it in advance. So that’s the first step of planning — being clear on what result you want, and then being able to switch off everything that is not that. Now you might be thinking, well if I turn off all these opportunities, they’ll be gone, I might not be able to do them again. All I’m suggesting is that you set a review point. And I’ll talk about deadlines in a little bit. But what I think is most important at this stage is recognize that you don’t have to make a decision right now, this instant, today. You can defer it. You can even do this with your inbox. The only things that should be coming to your inbox are things that require action instantly. If not, you should be setting a filter for those things and pushing them to a place where you can review them later. In a training episode, the December 2015 training episode for SuperFastBusiness members, I talked about my second layer filter in my email box, which empowers me. That’s why my inbox runs empty every day because I’ve got this figured out, and I was able to set a system where the only things coming to my inbox require action. Everything else is set for a review point. So it doesn’t mean not ever, it just means not right now. So if someone comes to you with this fantastic opportunity, then agree to meet them at your station, the destination that you’ve planned. When you get there, you’re happy to have a chat about it. But until then, you’re on a mission. So think of it as being on a very specific, defined mission and anything else is a distraction. And everything around you is dragging at you to try and distract you from achieving that and that’s what we’re going to resist now because we’ve got momentum. The more coal you shovel, the closer you get to the destination, especially when it’s inside. You’ll be able to get to that last stretch, and that’s where people just don’t make it because they’re getting off the train all the time and getting distracted. So less distraction, more focus. Now one way to really help power up your journey is to quickly worn on getting your first offer that converts. This is important. The most important thing. I talked about this in my episode about there being no holy grail. Find your offer that converts. Do it in a minimum viable way. So if you are keen on selling anything, what you want to do is have someone vote with their wallet. You want someone to be able to buy the thing at least in a draft version or pre-paid, or indicate interest with some kind of financial commitment. I’m not talking about behavioral surveys or research workshops or a vote that you put out to Facebook of all places. You’re not going to get much feedback from that. What you really need is a living, breathing human who’s going to put money down for your offer. If you can do that, then you’ve got confidence that your goal is worthy and that it is going to be achievable. So in most cases, you can build your offer in a basic form and you can have that happening before you have to create product or deliver on whatever it is that you’ve sold. You’ve seen classic examples of that with sites like KickStarter. But the other simple examples are running an event. You could also sell a training course that’s delivered over live sessions in the multipart format in advance. So these things are good ways to test the financial capacity of your market and your reach. So simpler, smaller, more achievable results will really help you get confidence to strip away all the opportunity because now you have reality. Welcome to my world, where things are real, where you have the confidence to move forward because it’s actually working for you. See, I am talking from experience when I tell you that I did start out worrying about fonts and designs. I didn’t even have an offer for a long time until I discovered an affiliate promotion that I could actually sell. I really should’ve focused on that much earlier. My first $100,000 online came from promoting one affiliate offer and building up that as a website and then a little business, until I kind of maxed out that market. And then later on, it died. So I learned that Richard Koch was right when he said that business is a book of bets, that we want one main bet, and we want lots of little small bets with long odds. I had my main bet but I started having side bets with long odds. So start with your main bet and see if you can get something working. And once you do, and there’ll be lots of failed experiments, but once you do, that’s when you have the confidence to build your railway out, and you’ll get to the destination. It would’ve saved me a lot of time if I just gotten focused on that offer. So just a quick recap, instead of falling into other people’s plans, we are creating our own plan for once. Instead of just consuming, we’re starting to create. And some people who are weak with their plans really just fall victim to everyone else’s, and they’re the ones funding the guru’s lifestyle. They’re paying for all the cars, and the houses, and the travel because they’re just continually funding on hope, and they never actually implement. So they don’t even know whether the course works or not. That’s not you anymore. You are now investing in things that get a return on investment and you’re executing along the way. So turn off that opportunity magnet that’s so built in to entrepreneurs. And recognize that opportunities are absolutely everywhere around you in everything. You are by definition a problem solving machine because you’re human. And because you’re a problem solving machine, everything you look at looks like a problem that needs solving. But I want you to focus on only the problem that you’ve given your fully concentrated effort to and then let go of everything else. And now you can apply all of your full focus and energy on that mission. So in the next episode, I’m going to talk about the three layers of planning, and we’ll be moving forward through to the execution phase. So I hope you’ve enjoyed part one of this planning mini-series. The first action step is for you to go and do a purge. Get rid of all the ideas that are in your head and start looking at the data from your last year or so, and see where the results came from, and hone in on that, and start thinking about where you’re going to build that railway track to, what’s the destination going to look like? Because we’re going to get deeper into the next episode. If you’re enjoying it, be sure to subscribe on iTunes and leave a rating. Great show. Love the double whiteboard. I’ve just started running the “scrum method” in my business and personal life and noticed a marked difference in productivity. Tip by Ed Dale to use physical post-it notes for my tasks on a whiteboard (instead of digital) has changed my relationship with tasks. Less reactive and way more deliberate. Cheers mate will take a listen over lunch today! Thanks James, this episode helped me tremendously. I have been trying to do way too much, and I knew to succeed I needed to focus on 1 thing. I’d read the One Thing, and I knew the importance of cutting everything else out, but was finding it very difficult to actually do that. What you said about as entrepreneurs we have learnt the skill set of spotting opportunities, and not to have the Fear of Missing Out, as we will always have that skill and always be able to spot more opportunities has been the final part I was missing to be able to let go of everything else and Focus. I’m glad you made the connection to the opportunistic habit that robs us of moving forward. Keep it simple and you will get down your trainline faster! Well I certainly like some the how too’s already. only just referred to your program by Andy Spiel so have been pretty much been entangled by the web of following some else’s plans, and confused as to my mission in life and look forward to planing as I’m directed to more practical steps of getting things to work, at present in Affiliate business, but the model is put me overwhelm. Hi Janice. It is normal to get overwhelmed at first and you will surely get past that as you keep things simple and focus on the least number of things to do at once. Good luck. I hope I can train you inside SuperFastBusiness membership one day.